#1. This week's number one is an international guard Emmanuel Mudiay (196-96, currently plays in NBA). He could not help the New York Knicks (9-25) in their last game. Despite Mudiay's very good performance the New York Knicks (9-25) were badly defeated 128-110 on the road by the Phoenix Suns. He was the top scorer with 32 points. Mudiay also added 6 rebounds and dished 6 assists in 33 minutes on the court. It's Mudiay's first season with the team. He has individually a very good year with high stats. Mudiay averages: 14.4ppg, 3.0rpg, 3.6apg, 2FGP: 53.0%, 3FGP: 33.3% and FT: 74.2% in 27 games he played so far. He played for the DR Congolese senior national team one years ago. #2. Second place goes to an international small forward Christian Eyenga (201-89, currently plays in Spain). Eyenga was not able to help one of league's weakest teams Baloncesto Fuenlabrada (5-8) in their last game on Saturday. Despite his very good performance Baloncesto Fuenlabrada was defeated 89-80 on the opponent's court by the higher-ranked Burgos (#13). Eyenga was the second best scorer with 16 points. He also added 8 rebounds and 3 assists. Eyenga's overall stats this season are: 7.9ppg, 2.8rpg, 1.1apg, 1.2spg, 2FGP: 37.5%, 3FGP: 32.1% and FT: 78.3%. He is in the roster of the DR Congolese senior national team. #3. The DR Congolese player who performed third best last week abroad was an international power forward Evariste Shonganya (204-92, currently plays in Sweden). He was not able to secure a victory for KFUM Jamtland (12-7) in their last game on Saturday. Despite Shonganya's very good performance KFUM Jamtland was defeated 86-73 in Sodertalje by the leading Kings. He recorded a double-double by scoring 17 points and getting 11 rebounds. Shonganya also added 3 assists and 3 blocks. This season Shonganya has very high stats. He averages: 17.1ppg, 11.7rpg, 3.8apg, 1.7bpg, 1.2spg, 2FGP: 56.2%(118-210) and FT: 56.4%. Shonganya is also a member of the DR Congolese senior national team. #4. Forward Omari Gudul (206-94, agency: Two Points, college: Angelo St., currently plays in France) couldn't help ADA Blois (5-6) in their last game. Despite his very good performance ADA Blois lost 71-82 on the opponent's court to the one of league's weakest teams (#17) Paris. Gudul had a double-double by scoring 17 points and getting 12 rebounds in 26 minutes; quite an impressive performance considering it's only his third season in pro basketball. But this is still an early stage of the season and everything may happen. Gudul has relatively good stats this year: 14.5ppg and 6.8rpg in 11 games. He is also DR Congolese national team player. #5. International guard Mathieu Kamba (196-95, agency: Dynamics Global Management, college: Cent.Arkansas, currently plays in Spain) couldn't help Araberri (5-9) in their last game on Friday. Despite Kamba's good performance Araberri was defeated 92-87 on the opponent's court by the second-ranked Palencia_Baloncesto. He scored 14 points and grabbed 7 rebounds. This season Kamba has relatively solid stats: 13.4ppg, 3.6rpg, 1.5apg and 2.1spg. He has a dual citizenship: Canadian and DR Congolese. Kamba plays currently for the DR Congolese national team. #6. Forward Jonathan Kasibabu (203-96, currently plays college basketball in the States) managed to help Fairfield University to win against the University of New Hampshire 63-57 in the NCAA last Saturday. Kasibabu scored 5 points and grabbed 9 rebounds. The Fairfield University has conference record this season. Kasibabu is one of the most experienced players in a team as it's his fourth year in Fairfield's roster. His overall stats this season are: 9.9ppg, 7.3rpg, 1.3apg and 1.1spg. Kasibabu is an international player who is currently on the senior DR Congolese National Team roster. #7. International swingman Shekinah Munanga (201-97, currently plays in France) couldn't help Etoile Angers (7-1) in their game against Lourdes-Tarbes (4-10) in the French NM1 (third division). He scored 5 points and grabbed 11 rebounds. The first-placed Etoile Angers (7-1) was defeated 69-56 on the opponent's court by the much lower-ranked Lourdes-Tarbes (#12) in the Group B. Munanga's overall stats this season are: 4.8ppg and 4.3rpg. He is also DR Congolese national team player. #8. Power forward Jonathan Malu (200-93, currently plays in Germany) couldn't help Artland Dragons (7-9) in their game against Ehingen/Urspringschule (8-8) in the German ProA (second division). Malu recorded only 4 points. Artland Dragons was edged 85-83 in Allmendingen by the higher-ranked Ehingen/Urspringschule (#9). It was Artland Dragons' fifth consecutive loss in a row. Malu's overall stats this season are: 3.4ppg and 1.5rpg. He plays currently for the DR Congolese national team. #9. Former U18 international forward Patrick Mwamba (196-99, currently studies in the States) contributed to an Texas Arlington's victory against the Cal Poly - San Luis Obispo 75-70 in the NCAA in Friday night's game. Mwamba recorded only 4 points and grabbed 4 rebounds in 26 minutes. The University of Texas at Arlington has conference record this season. This year Mwamba's overall stats are: 4.6ppg, 3.4rpg and 1.7spg in 10 games. He used to play for the DR Congolese U18 national team two years ago. #10. 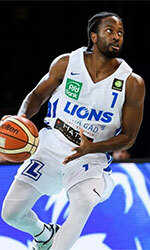 Point guard Carl Ona-Embo (185-89, currently plays in Germany) led Lions to a 1-point victory over the league outsider White Wings (3-13) 80-79 in the German ProA (second division) in Saturday night's game. He was MVP of the game. Ona-Embo recorded 17 points. PS Karlsruhe Lions (8-8) is placed seventh in the ProA. It was his team's fifth consecutive victory in a row. Ona-Embo has reliable stats this season: 10.3ppg, 1.5rpg and 1.5apg. Ona-Embo attended previously one of camps at Eurobasket Summer League on his way to pro basketball. Despite he played previously for the French U20 national team, Ona-Embo is also an international player who is currently on the senior DR Congolese National Team roster. #1. Junior Etou (203-F-94, college: Tulsa, currently plays in Turkey) could not help Sakarya BSB (4-7) in their last game. Despite Etou's good performance Sakarya BSB was crushed 82-57 on the road by the second-ranked Darussafaka. He was the second best scorer with 13 points. Etou also added 6 rebounds in 27 minutes. It was Sakarya BSB's fifth consecutive loss in a row. There are only three games left until the end of the Regular Season. So now every game will be critical. Etou has relatively good stats this year: 10.8ppg, 7.5rpg and 1.2apg in 11 games he played so far. #2. Charles Kahudi (199-SF-86, currently plays in France) contributed to an easy victory against the closely-ranked JL Bourg (12-3) 81-66 in the French ProA last Saturday. He scored 7 points in 21 minutes. It was the game of the round between two top 4 ranked teams. ASVEL Lyon-Villeurbanne Basket (12-2) is placed first in the ProA. It was his team's fifth consecutive victory in a row. Kahudi is one of the most experienced players in a team as it's his fourth year in ASVEL Lyon-Villeurbanne Basket's roster. Kahudi has relatively good stats this season: 10.8ppg and 4.4rpg in 10 games. He has a dual citizenship: DR Congolese and French. #3. Cedric Kuakumensah (204-F-93, college: Brown, currently plays in France) led Souffelweyersheim to a victory against the third-ranked Saint Vallier (10-6) 78-64 in the French NM1 (third division) on Saturday night. Kuakumensah recorded 11 points, 9 rebounds and 6 blocks. It was the game of the round between two top 3 ranked teams in Group A. BC Souffelweyersheim (15-1) is placed first. It was his team's 13th consecutive victory in a row. Kuakumensah has relatively good stats this season: 10.8ppg, 7.4rpg and 1.6apg. He is a naturalized American. Strangely Kuakumensah has never played in DR Congo. #4. Bambale Osby (203-C-86, agency: Octagon Europe, college: Maryland, currently plays in France) was not able to help ALM Evreux (6-5) in their last game on Tuesday. Despite his very good performance ALM Evreux was badly defeated 98-79 in Rouen by the lower-ranked SPO Rouen (#9). Osby recorded 15 points and grabbed 6 rebounds. But the season just started, so everything may happen. Osby's overall stats this year are: 9.7ppg and 5.7rpg. He is a naturalized American. Worth to mention Osby played also at Eurobasket Summer League, which helped him get the job in pro basketball. Strangely Osby has never played in DR Congo. #5. Joel Ntambwe (206-F-98, currently plays college basketball in the States) contributed to UNLV's victory against the University of Hawaii 73-59 in the NCAA on Saturday night. He had a double-double by scoring 17 points and getting 11 rebounds in 34 minutes. The University of Nevada - Las Vegas have conference record this season. This year Ntambwe's overall stats are: 9.2ppg and 4.7rpg in 10 games. #6. Christian Musoko (203-F/C-96, college: S.Utah, currently plays in Georgia) was not able to secure a victory for Mgzavrebi (4-3) in their last game on Wednesday. Despite his good performance Mgzavrebi was edged 75-72 at home by the league outsider Energy Invest (#10). Musoko recorded a double-double by scoring 11 points and getting 10 rebounds. Musoko's overall stats this season are: 9.3ppg and 6.3rpg. He is another player who holds two passports: DR Congolese and Canadian. #7. Kevin Tumba (206-C/F-91, currently plays in Basketball Champions League) managed to help Universidad Catolica de Murcia CB in a victory against the seventh-ranked Ventspils 67-61 in the Basketball Champions League last Wednesday. Tumba scored only 2 points in 18 minutes. This year Tumba's overall stats are: 4.0ppg and 4.0rpg in six games. He has both DR Congolese and Belgian nationalities. #8. Viny Okouo (215-C-97, currently plays in Spain) couldn't help Unicaja Malaga in their game against Baskonia in the Spanish Liga Endesa. Okouo cannot count Sunday's game as one of the best ones. He recorded only 2 points. His team was badly defeated by 17 points 81-64. Okouo's overall stats this season are: 2.0ppg and 1.5rpg. #9. Nicola Akele (203-F-95, college: Rhode Island, currently plays in Italy) couldn't help Roseto Sharks in their game against Tezenis VER in the Italian Serie A2 (second division), despite his very good performance in Sunday night's game. He had a double-double by scoring 16 points and getting 12 rebounds. Akele also added and 3 steals in 48 minutes. But his team lost 97-105. This year Akele has relatively solid stats: 13.5ppg, 6.5rpg and 1.2spg in 13 games. He also holds two passports: DR Congolese and Italian. Despite Akele's DR Congolese nationality, he previously played for the Italian U20 national team and is probably not eligible to play for the DR Congolese team. #10. Experienced Guy Muya (193-PG-83, currently plays in Belgium) contributed to a 1-point Basic-Fit Brussels' victory against the league leader Oostende 59-58 in the Belgian Euromillions League on Saturday night. He scored only 2 points and had 3 steals in 23 minutes. This year Muya's overall stats are: 5.1ppg, 2.4rpg and 1.2apg in nine games. He has DR Congolese and Belgian nationalities.